For Little E’s second birthday party, I tried to think about what she might like the best, but she wasn’t really attached to anything in a big way. 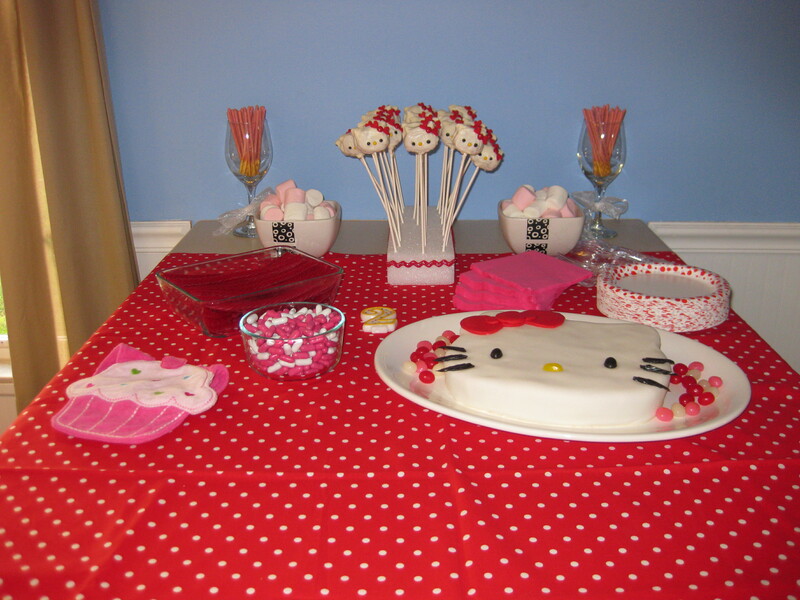 I finally decided that she loved cats, so I went with a Hello Kitty party, which ended up being fun to decorate! 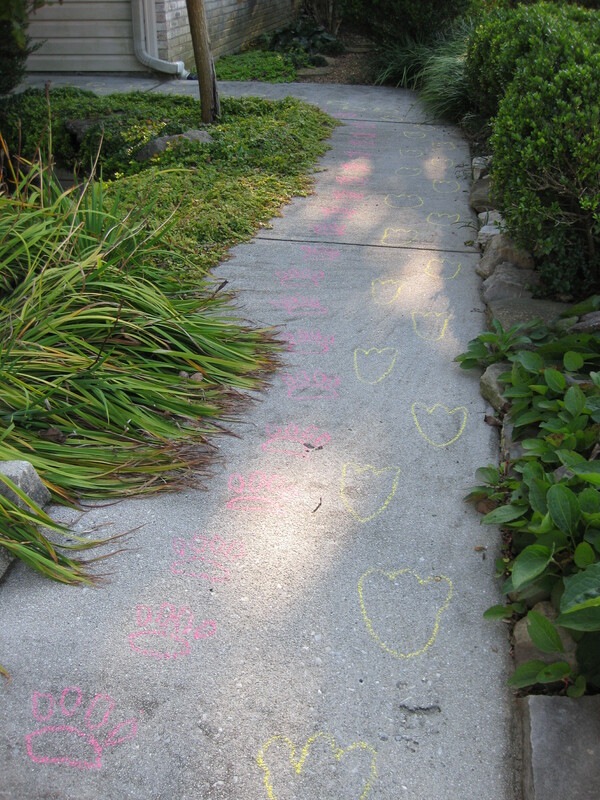 This is hard to see, but the guests followed Hello Kitty’s and Tuxedo Sam’s footprints up the walkway to the party, where they were met by a welcome sign on the door. I made streamers/banners out of regular colored paper cut into triangles and stapled onto fun ribbon. 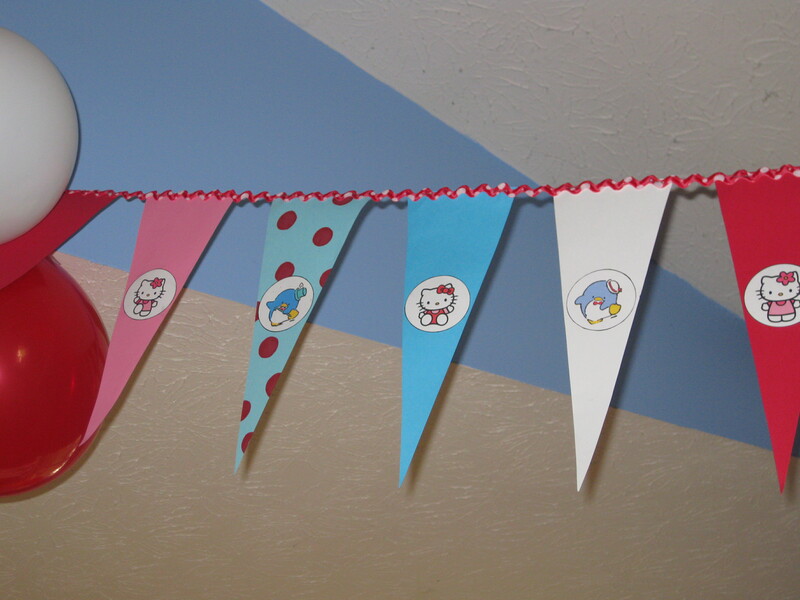 I found pictures of Hello Kitty and Tuxedo Sam (for the boys who would be attending), and glued them on the banners, as well. I put those everywhere, even in the front of the house. It was cheap and fairly easy to make, so why not? To make it cheaper, I even hand colored the polka dots on the blue paper. I’m writing about this party a few years after I actually did the party, so now I think that was a bit insane. I don’t remember where I got the idea for the cake, but it was extremely simple. I bought some pre-made fondant, rolled it out, and draped it over a cake that I cut into the shape of Hello Kitty’s head. 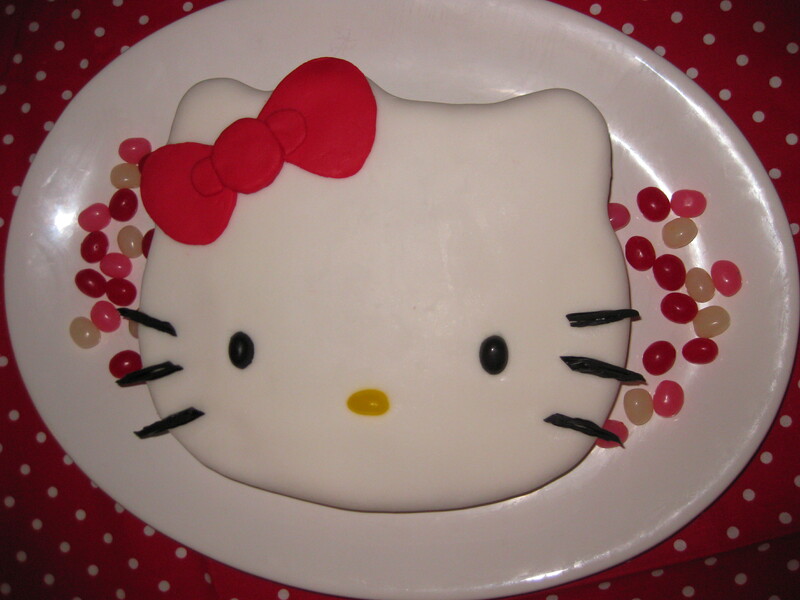 I actually printed out a large picture of Hello Kitty’s head and placed it over the cake to make sure that I had the right shape as I was cutting, and the right place for the eyes, nose, whiskers, and bow. The eyes and nose are made out of jellybeans (the reason I used jellybeans as decoration around Hello Kitty’s face to help break up the white). The whiskers were black licorice. 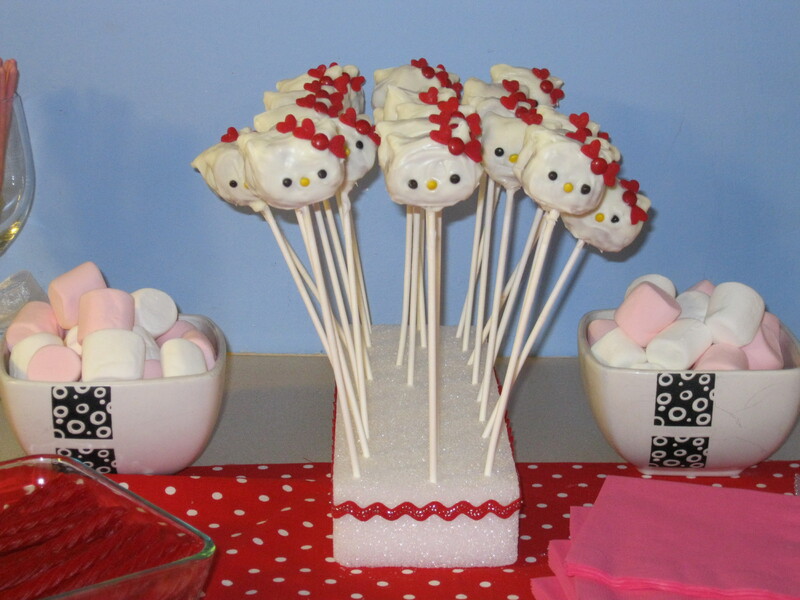 These cake pops were NOT simple. They about drove me crazy to make, but they were so cute, I just kept making them. They didn’t turn out as cute as the original from Bakerella (http://www.bakerella.com/here-kitty-kitty/ ), from whom I found great directions, but they were fine for my expertise level. For activities, the kids colored Hello Kitty coloring pages printed from the Internet, played pin the bow on Hello Kitty, got their faces painted very simply with a cat’s nose and whiskers or lines like Tuxedo Sam, and since the guests were so young, I also left balloons scattered on the ground for play. 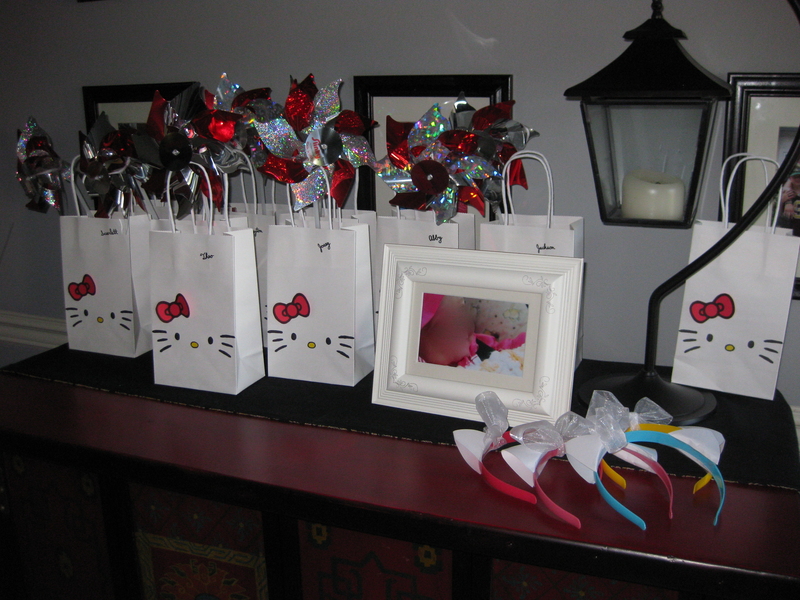 For favors, I made these little Hello Kitty bags (I wish I could remember my source for them), again using a printout of Hello Kitty’s face to ensure accuracy. 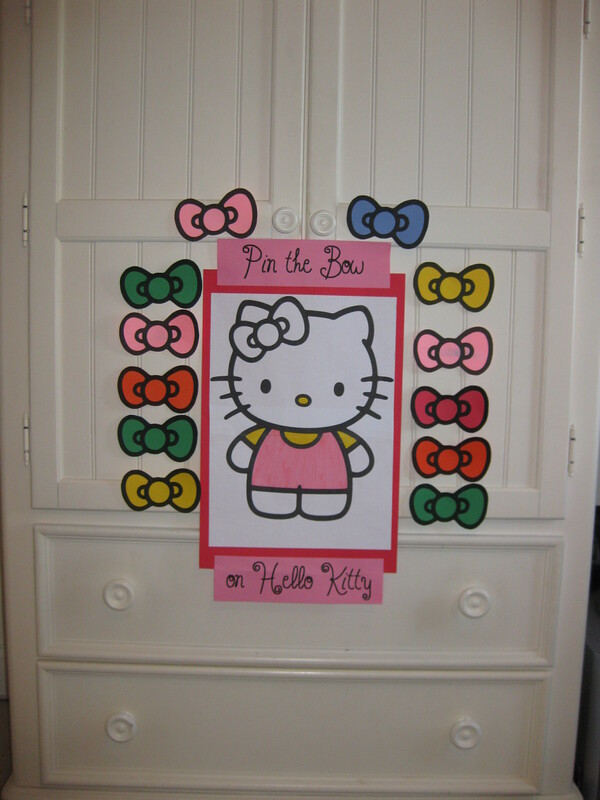 The bows were printed on colored card stock, cut out, and glued in the right spot. I also gave out headbands to the girls with white cat ears made out of paper taped on top and ribbons tied in a bow. I gave out a pinwheel each and Hello Kitty stickers, along with some other simple trinkets. 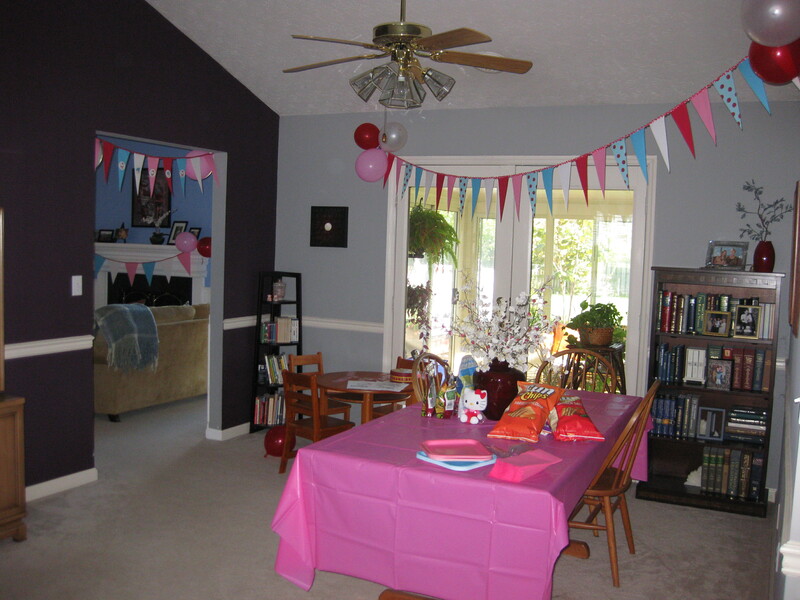 It was a very cheap, but fun little party!